With our products installed and painted. We are continuously adding more photos. 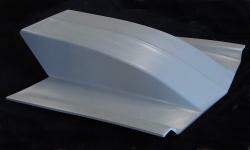 This stock replica hood is designed with a full inner structure to insure that it will not "bow" upward at high speed. It comes without hinge attachments, which are available at extra charge. 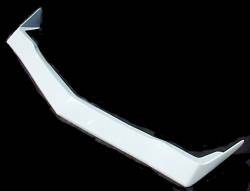 This hood can be used for bonding in the scoop of your choice. Vega cowl induction. Open in rear to allow cold air from windshield to enter engine compartment. This increases power and mileage. Designed to allow extra carb clearance (2-1/4"). Molded edge on all 4 sides to insure perfect fit. Smooth grey gelcoat surface for lasting durability. Complete fiberglass inner structure (similar to original GM). Small steel threaded inserts are molded in (front) for attachment to original hinges is desired. Bolts included. V-185 4-3/4" high cowl induction. Features smooth gel coat surface, complete fiberglass inner structure (similar to original GM). 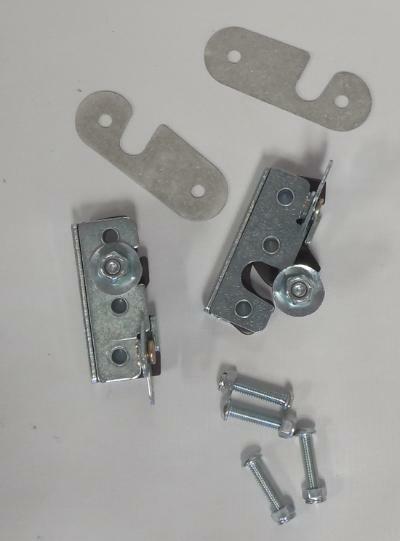 Small steel threaded inserts are molded in for attachment to original hinges is desired. Bolts included. V-185T same as V185 but has minimal inner structure to reduce weight. 4 pins required for installation of V185T. Front fiberglass bumper. To reduce weight but still keep the stock appearance. 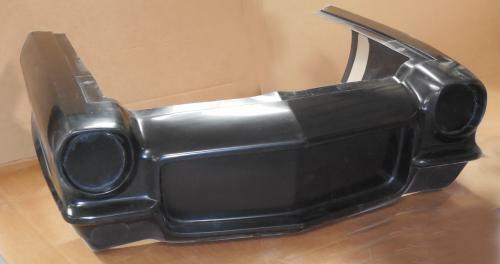 This bumper will bolt to original locations and is made from highest quality fiberglass construction. Can be painted flat black or painted to match the car. This replaces standard lower splash pan and has light holes blanked off. Lights can not be used. Reverse flanges are built in for easy mounting to original locations. Made from durable hand-laid fiberglass to resist cracking and fatigue. This panel is for racing use only. 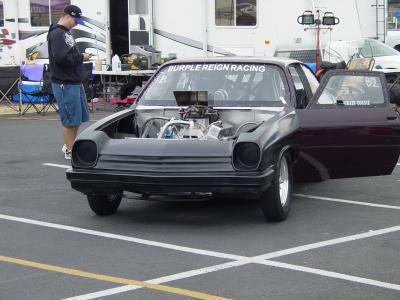 This is the early Vega hatch designed for racing. Built with very little inner structure and must be pinned or `Dzused' in place. Molded edges all around insure a perfect fit. Vents blanked off. See VW105 on page 70 for Vega Wagon hatch. 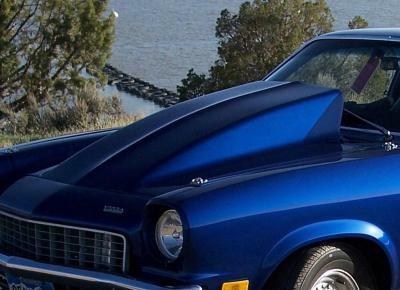 For extra clearance and the proper funneling of air to your carburetors, this hood is finished with the base of the snorkel built into the hood. 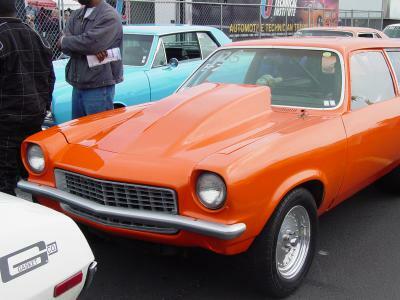 Because of the Vega's natural hump in the hood, the scoop measures 7" in front and 5" at the carburetor. Yet the scoop is not angled. Molded edges on 4 sides insure a perfect fit. For maximum racing weight reduction we highly recommend fiberglass doors. Unlimited's Vega doors have full built-in upper frame for easy mounting of Lexan windows. Full inner panel allows the mounting of your stock hinges, latches, handles and upholstery door panels. A full windshield length snorkel offers that extra clearance needed when a single four is on a tunnel ram manifold. Will also work with 2 fours on a tunnel, if engine is moved back at least 3". Scoop top is supplied along with hood. Has inner structure for strength. Made from highest quality materials for low weight. Rear fiberglass bumper replacement. Weighs less than 2 pounds but is very durable. 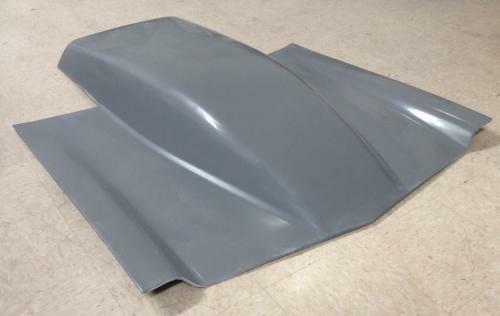 All bumpers have smooth grey gelcoat for easy painting. Bolts to original brackets. This panel is the filler behind the front bumper. 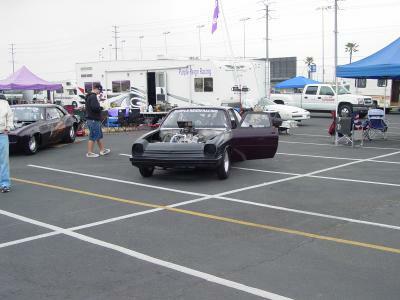 It runs the full width of the car and bolts to original places. Made from all hand-laid fiberglass to outlast original factory panel. Start with V127, remove the upper snorkel box, bolt on Unlimited's exclusively designed aero-top (AT475), and presto, you have modernized! Aero scoops are taking over. This smoothly styled unit will certainly enhance the looks of any Vega, yet is very functional. Scoop is 44" long (40" version available upon request, see V486). Height is 8". Open underneath for maximum clearance. Similar to V286 but with the smaller version of aerodynamic scoop (40" long). Overall height is 8". 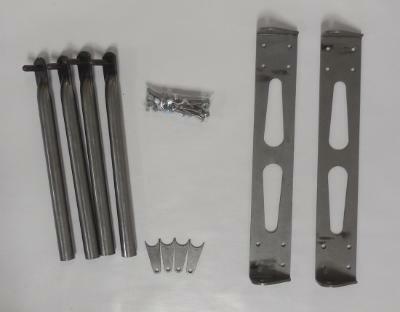 Inner bracing for low weight and rigidity. 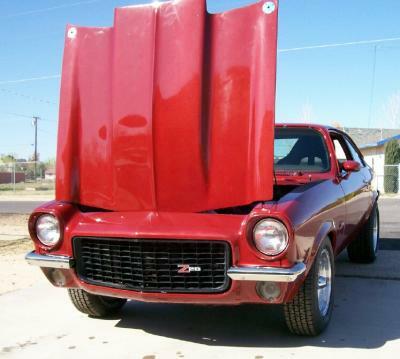 Simplicity and low weight are the number one factors for choosing this wraparound front end. Can be mounted to stock or tube chassis. Designed to work with any of Unlimited's hoods or any hood made to stock width and length. Lights can be mounted to built in light buckets. Grill is blanked off (can be slotted for air flow if desired). Specially designed 'built in' front bumper to give 'stock' look. 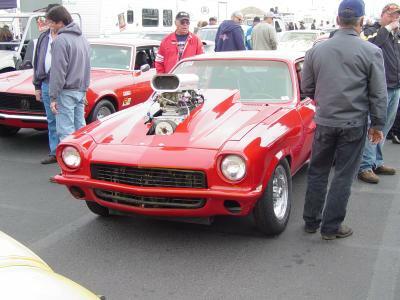 Built in 3 inch "Chin Spoiler". This one piece nose with bumper has internal flanges for mounting to the fenders. Headlights can be installed and the grill is blanked off. We recommend the use of our V205 air dam with this piece. Grill can be slotted for desired air flow. 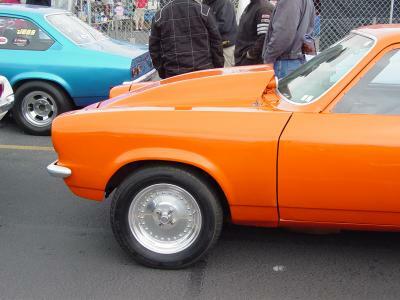 Vega wagon rear hatch. Has recessed flange for mounting Lexan window. This is a light weight pin on style. Molded edge around outer portion of window frame insures a perfect fit. 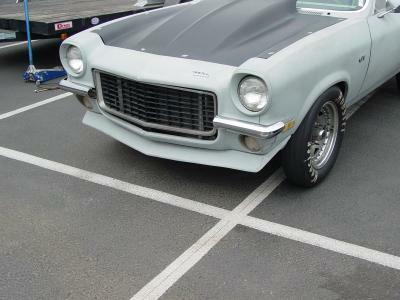 Front fiberglass 74-77 Vega bumper. Can be used for street or strip. Bolts to original locations and can be easily painted or remain 'grey'. Unlimited's exclusively formulated gel coat surface does not require painting. It will last many years without surface degradation. This lower front air dam (Chin Spoiler) is designed to be used with our V208 nose only and will not work with a stock front end. It includes built in mounting flanges for mating up to the fenders. Height is 3". 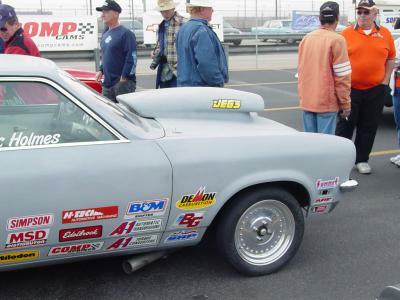 Rear bumper designed for racing, but can bolt to original brackets. Will not withstand any crashes but will give the stock look, and reduce weight. Can be painted flat black or color of car. V701 Fits 71-77 Vega. 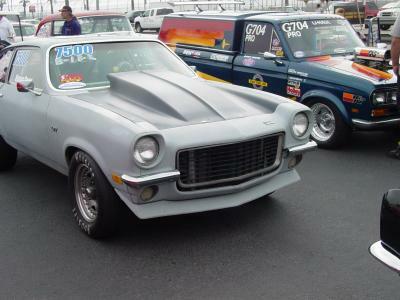 (Style is 1971 -1973 Vega) Full wrap-around front end. 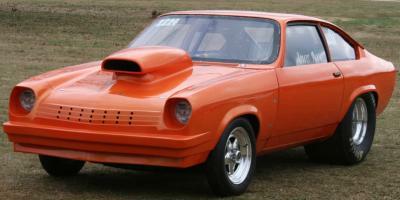 Features twin, built in "bumperettes" instead of the full bumper. Grill can be installed as well as original head lights. Recessed area for attaching a full race hood. 10 inch high cowl induction hood for Vega. Features smooth gray gel coat finish. The original GM plastic doesn't hold up very well. Replace your front splash pan with dent and rust resistant fiberglass. This piece will bolt to stock locations. Light sanding is all that is needed to prep for paint. Grey gel coat finish. Top edge has mounting flange. 6-1/2 inches high. Ends wrap around.